Here is a cute and delicious idea for Christmas. These can be made and given as gifts or hung on the Christmas tree. I plan on storing some in an airtight container until Christmas Day and then my family and friends can pick an ornament from my tree that is edible and delicious. For these pretzel wreaths you will need 9 small pretzels for each wreath, melted chocolate chips to adhere the pieces together and candy of your choice for decorating. I used M&Ms and colored sugar. Lay your pretzels out on parchment or wax paper (to catch the extra chocolate and sugar, this could get messy) to the size you want, like I said I used 9 pretzels in total per wreath, 5 on the bottom and four on the top. I dipped each of the bottom pretzels in the melted chocolate and placed on the parchment paper in the shape of a wreath. Then I dipped the 4 remaining pretzels and placed them so they would overlap the bottom layer. While the chocolate was still wet I added my candy and colored sugar. I had a bit of chocolate and a few pretzels left over so they also got dipped in chocolate and pretty much eaten immediately. I did manage to snap one picture before they disappeared (in my mouth, YUM). 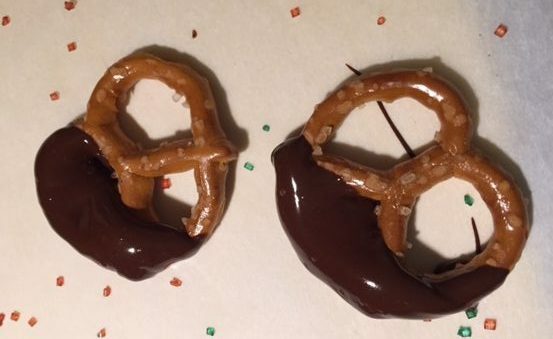 Dipped pretzels by themselves would make excellent presents – I know I’d like them. 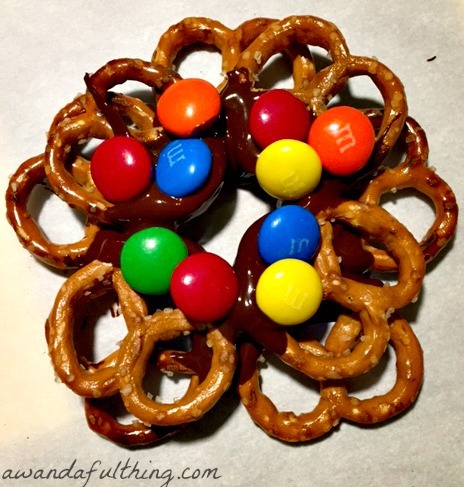 Day 11 – Edible DIY Pretzel Wreaths – It’s A Wandaful Thing! This entry was posted in DIY, Food, Make and tagged 12 Days of Christmas, bake, candy, cheap, chocolate, colored sugar, combo, December, Decorate, delicious, dipped, DIY, easy, edible, Food, gifts, ideas, inexpensive, make, present, pretzel, pretzel wreath, ribbon, salty, simple, sugar, sweet, wreath. Bookmark the permalink. Thank you for your comment Lori – I will definitely join your challenges in the future. Such a fun and creative project! Looks so yummy! Thank you for joining us for the Anything Goes Christmas Challenge at Perfectly Created Chaos. I hope you join us again soon! Thank you Bernadine, I hope you continue to follow the blog and find some other things that interest you….